HomeDoes chlorhexidine bathing work for Gram-negative bacteria? Does chlorhexidine bathing work for Gram-negative bacteria? The idea of “source control” – using chlorhexidine to reduce the amount of bacteria on a patient’s skin – makes a lot of sense. 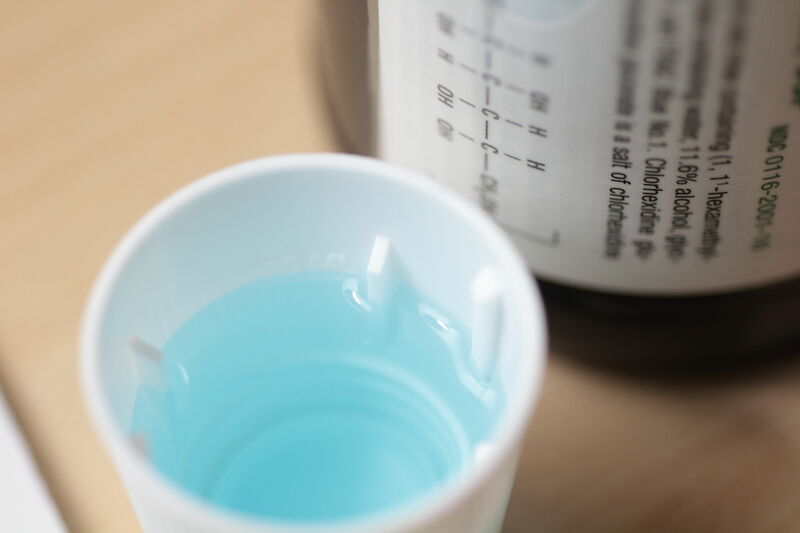 There’s mounting evidence that chlorhexidine daily bathing works for Gram-positive pathogens, especially in the ICU.1 For example, one of the first thorough studies of chlorhexidine gluconate (CHG) daily bathing showed that the amount of VRE on the skin, in the environment and transmitted to others were all reduced by implementing CHG daily bathing.2 A number of more recent high-quality studies have provided evidence that CHG daily bathing in the ICU setting helps to prevent the transmission of Gram-positive bacteria (see Table below – although note that studies have not been universally positive for CHG). Table: Studies evaluating the impact of chlorhexidine daily bathing (with or without other interventions) including data on Gram-negative bacteria. The question of whether CHG is effective for the prevention and control of Gram-negative bacteria is rather more complicated. The main issue is that Gram-negative bacteria are less susceptible to CHG than Gram-positive bacteria.17 In theory, this shouldn’t be a problem because the amount of CHG applied to skin (10,000 mg/L) is much higher than the minimum inhibitory concentration (MIC) of most Gram-negative bacteria.17 However, it’s worth noting that the concentration of CHG measured on the skin of patients being treated with CHG in one study was considerably lower than the amount applied (15-312 mg/L before the daily bath and 78-1250 mg/L after the daily bath).18 Nonetheless, in this same study, CHG was found to be effective in reducing the skin burden of CRE on patients in a long-term acute care hospital (see Figure, below).18 So, should CHG bathing be applied to combat MDR-GNR? Figure: Impact of chlorhexidine gluconate (CHG) daily bathing on skin colonization with KPC-producing K. pneumoniae in 64 long-term acute care patients (difference is statistically significant, p=0.01). A number of studies have implemented CHG as part of a bundle of interventions to control various MDR-GNR. For example, a team from Thailand found that an intervention aimed at improving environmental hygiene combined with CHG brought an outbreak of A. baumannii under control.8 The National Institute of Health Clinical Center19 has included CHG bathing as a component of a successful CRE control bundle, and the same goes for long-term acute care hospitals.6,11 Meanwhile, a Dutch study found that implementing CHG bathing combined with improving hand hygiene failed to reduce the acquisition rate of ESBL Enterobacteriaceae.4 A Mexican study implemented CHG bathing combined with improved hand hygiene and reported a significant reduction in VAP due to A. baumannii.7 However, in all of these studies, it is not possible to tell whether it was the CHG or another element of the bundle that made the difference (or not, in the case of the Dutch study). No study has been designed specifically to evaluate the impact of CHG daily bathing alone on the rate of Gram-negative bacteria infection or colonization, although rate of Gram-negative bacterial infection or colonization has been reported in several studies of CHG. A small number of high-quality studies that have evaluated CHG as a single intervention including randomization have failed to demonstrate a reduction on Gram-negative BSIs and CLABSIs (see the Climo9, Mlistone10 and Camus16 data from the Table above). Also, a non-randomised before-after study in a trauma ICU reported a non-significant reduction in Acinetobacter species colonization.12 Several other studies mention the rate of Gram-negative infection or colonization in passing, but the numbers are too small for meaningful statistical analysis (see Seyman,5 Popovich13, Bleasdale,14 and Gould15). 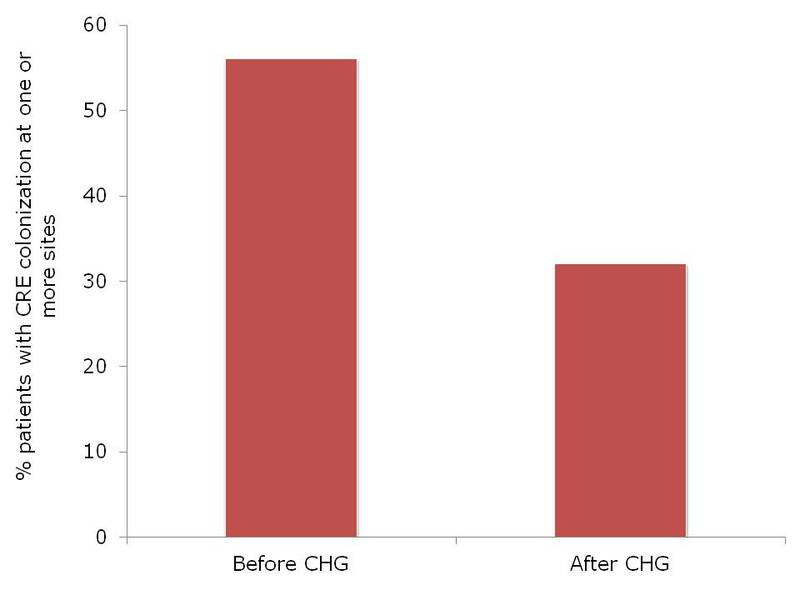 Although these studies do not provide convincing evidence that CHG works for Gram-negative bacteria, it’s important to remember that they were not powered to evaluate the impact of CHG on Gram-negative bacteria. So, does CHG bathing work for Gram-negative bacteria? Based on current data, we simply don’t know. Derde LP, Dautzenberg MJ, Bonten MJ. Chlorhexidine body washing to control antimicrobial-resistant bacteria in intensive care units: a systematic review. Intensive Care Med 2012; 38: 931-939. Vernon MO, Hayden MK, Trick WE et al. Chlorhexidine gluconate to cleanse patients in a medical intensive care unit: the effectiveness of source control to reduce the bioburden of vancomycin-resistant enterococci. Arch Intern Med 2006; 166: 306-312. Noto MJ, Domenico HJ, Byrne DW et al. Chlorhexidine Bathing and Health Care-Associated Infections: A Randomized Clinical Trial. JAMA 2015 in press. Derde LP, Cooper BS, Goossens H et al. Interventions to reduce colonisation and transmission of antimicrobial-resistant bacteria in intensive care units: an interrupted time series study and cluster randomised trial. Lancet Infect Dis 2014; 14: 31-39. Seyman D, Oztoprak N, Berk H, Kizilates F, Emek M. Weekly chlorhexidine douche: does it reduce healthcare-associated bloodstream infections? Scand J Infect Dis 2014; 46: 697-703. Hayden MK, Lin MY, Lolans K et al. Prevention of Colonization and Infection by Klebsiella pneumoniae Carbapenemase-Producing Enterobacteriaceae in Long Term Acute Care Hospitals. Clin Infect Dis 2014 in press. Martinez-Resendez MF, Garza-Gonzalez E, Mendoza-Olazaran S et al. Impact of daily chlorhexidine baths and hand hygiene compliance on nosocomial infection rates in critically ill patients. Am J Infect Control 2014; 42: 713-717. Apisarnthanarak A, Pinitchai U, Warachan B, Warren DK, Khawcharoenporn T, Hayden MK. Effectiveness of infection prevention measures featuring advanced source control and environmental cleaning to limit transmission of extremely-drug resistant Acinetobacter baumannii in a Thai intensive care unit: An analysis before and after extensive flooding. Am J Infect Control 2014; 42: 116-121. Climo MW, Yokoe DS, Warren DK et al. Effect of daily chlorhexidine bathing on hospital-acquired infection. N Engl J Med 2013; 368: 533-542. Milstone AM, Elward A, Song X et al. Daily chlorhexidine bathing to reduce bacteraemia in critically ill children: a multicentre, cluster-randomised, crossover trial. Lancet 2013; 381: 1099-1106. Munoz-Price LS, Hayden MK, Lolans K et al. Successful control of an outbreak of Klebsiella pneumoniae carbapenemase-producing K. pneumoniae at a long-term acute care hospital. Infect Control Hosp Epidemiol 2010; 31: 341-347. Evans HL, Dellit TH, Chan J, Nathens AB, Maier RV, Cuschieri J. Effect of chlorhexidine whole-body bathing on hospital-acquired infections among trauma patients. Arch Surg 2010; 145: 240-246. Popovich KJ, Hota B, Hayes R, Weinstein RA, Hayden MK. Effectiveness of routine patient cleansing with chlorhexidine gluconate for infection prevention in the medical intensive care unit. Infect Control Hosp Epidemiol 2009; 30: 959-963. Bleasdale SC, Trick WE, Gonzalez IM, Lyles RD, Hayden MK, Weinstein RA. Effectiveness of chlorhexidine bathing to reduce catheter-associated bloodstream infections in medical intensive care unit patients. Arch Intern Med 2007; 167: 2073-2079. Gould IM, MacKenzie FM, MacLennan G, Pacitti D, Watson EJ, Noble DW. Topical antimicrobials in combination with admission screening and barrier precautions to control endemic methicillin-resistant Staphylococcus aureus in an Intensive Care Unit. Int J Antimicrob Agents 2007; 29: 536-543. Camus C, Bellissant E, Sebille V et al. Prevention of acquired infections in intubated patients with the combination of two decontamination regimens. Crit Care Med 2005; 33: 307-314. Stickler DJ. Susceptibility of antibiotic-resistant Gram-negative bacteria to biocides: a perspective from the study of catheter biofilms. J Appl Microbiol 2002; 92 Suppl: 163S-170S. Lin MY, Lolans K, Blom DW et al. The effectiveness of routine daily chlorhexidine gluconate bathing in reducing Klebsiella pneumoniae carbapenemase-producing Enterobacteriaceae skin burden among long-term acute care hospital patients. Infect Control Hosp Epidemiol 2014; 35: 440-442. Palmore TN, Henderson DK. Managing Transmission of Carbapenem-Resistant Enterobacteriaceae in Healthcare Settings: A View From the Trenches. Clin Infect Dis 2013; 57: 1593-1599. Horner C, Mawer D, Wilcox M. Reduced susceptibility to chlorhexidine in staphylococci: is it increasing and does it matter? J Antimicrob Chemother 2012; 67: 2547-2559. Otter JA, Patel A, Cliff PR, Halligan EP, Tosas O, Edgeworth JD. Selection for qacA carriage in CC22 but not CC30 MRSA bloodstream infection isolates during a successful institutional infection control programme. J Antimicrob Chemother 2013; 68: 992-999. Suwantarat N, Carroll KC, Tekle T et al. High prevalence of reduced chlorhexidine susceptibility in organisms causing central line-associated bloodstream infections. Infect Control Hosp Epidemiol 2014; 35: 1183-1186. The level of reduced susceptibility for bacteria in biofilms compared with their planktonic counterparts is often in the 100 to 1000 fold range. Since biofilms are an important part of the skin flora, this brings the moderately higher MICs reported for bacteria exposed to CHG very much into play (http://www.ncbi.nlm.nih.gov/pubmed/23288405)!